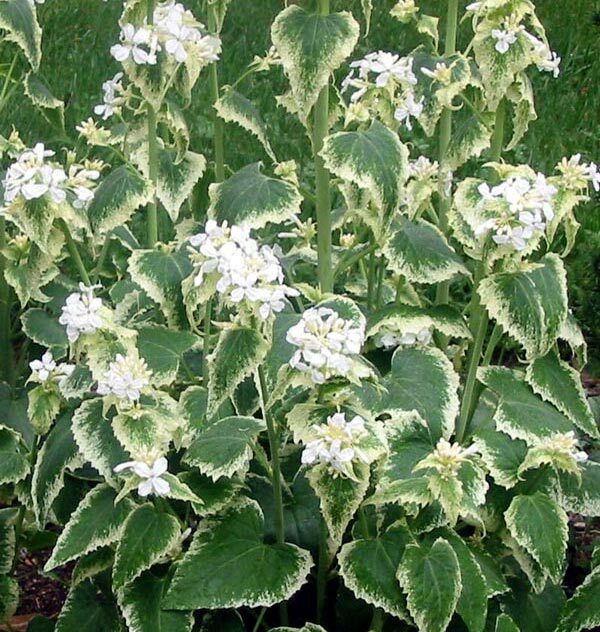 I actually bought three white flowering variegated plants from a mail order catalogue, before I realised they could be obtained quite easily from neighbouring gardens. But no meatter - now I have lots. I scatter the seed pods around when they've dried to imcrease my stock. 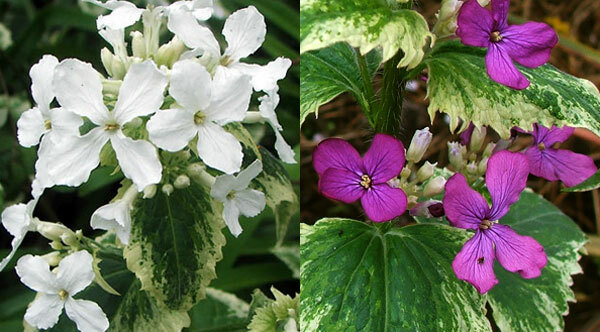 One day while visiting a small country nursery I spied some purple flowering variegated Honesty in the garden. The owner was kind enough to give me some seedlings, and I now have this variety in a number of garden areas as well. 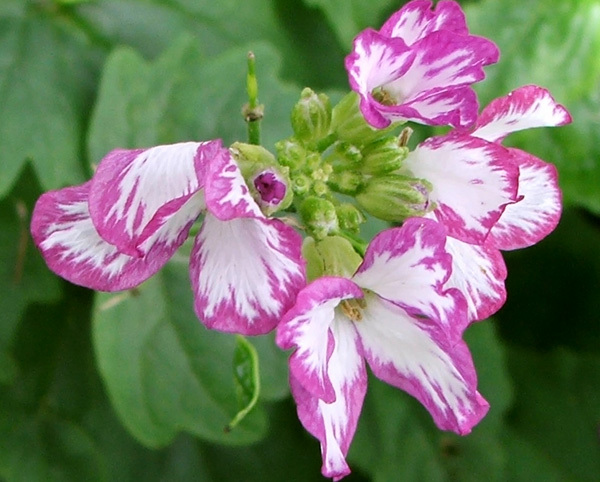 The combination of purple flowers with the leaf variegation is very appealing. 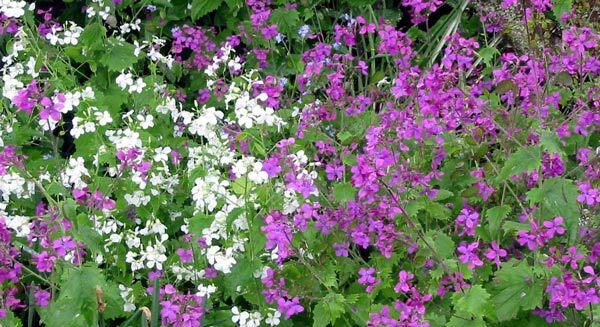 Honesty is a flowering plent which grows where it wants to - and always chooses the best locations. In difficult garden areas (like the dry semi-shaded Hump) I am guaranteed of a beautiful spring garden display. I can easily get swathes of Honesty growing under the gum and pine trees - perfect for spring woodland walks. Recently in the Wattle Woods I've spied a real treat - some Honesty plants where the flowers themselves have become speckled with purple and white. I'd like to thank the bees who made this pretty variation possible. I'm going to collect the seeds as soon as they're ready. I do hope (cross fingers) that they will carry the same coloured flowers. I hadn't met Honesty until I came here to garden at Mooseys. We arrived at the height of the flowering season, and the effect around some of the existing borders was amazing. What was this beautiful purple flowering plant? Was it a weed? Then a I visited a friend's garden and saw huge drifts of the white flowering variety. I happily scooped up seedlings to try to create my own white patch. Later on a visit to a local garden I saw a border full of variegated honesty with white flowers, and the gardener kindly sent me away with a bag full of plants. Honesty never lets me down. Even if I rake and scrape all the seedlings away by accident new ones will fill the spaces. My attempts at a solely white woodland patch have been successful, and I'm now waiting to see if the seeds carefully thrown in the Dog-Path garden are variegated like my roughly scribbled label said. The best thing about Honesty in flower is that is always takes me by surprise. The yellows of spring bulbs like daffodils are expected, but the scattered purple and white Honesty flowers sneak in unnoticed. Plants will position themselves in the oddest of places (which is a good thing!) 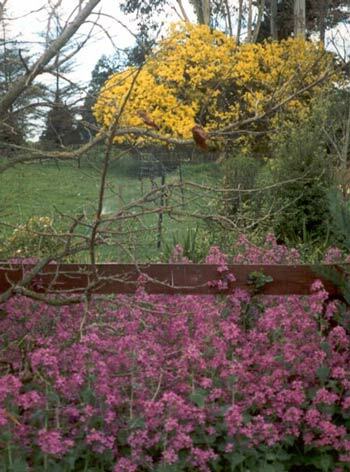 and will tolerate the dry conditions of garden areas like the Hump (which has pine and gum trees throughout). All in all, it's a very honest plant!